Big Cartel is a unique eCommerce solution marketed toward creatives who make and sell their own products. I just want to make that clear before you read this review so you don’t waste your time. This is not the platform for you if you own or want to start a general eCommerce store with a large inventory. However, if you’re an artist or craftsman who would normally sell their creations on a platform like Etsy, this platform is for you. It’s even a nice alternative to Etsy, whose transaction fees can be a little difficult to swallow. Big Cartel, on the other hand, allows you to sell independently on your very own website. Big Cartel was founded in 2005 and has since then “been a company built by and for artists.” They’re an independent, self-funded company co-founded by CEO Matt Wigham and designer Eric Turner. They have now grown into a team of over 30 people. The team is filled with creative people, many of whom know what tools and features creatives need to sell their own products effectively. They’ve even created an in-house art program called the Big Cartel Employee Art Grant that gives all employees the means they need to pursue personal projects they’re passionate about. Let’s see how this platform can help you achieve what you’re passionate about. Big Cartel is a simple ecommerce solution that makes it simple to design, build and run your own site so you can sell your own work without the help of a developer. Let’s go over some of the beneficial things this service has to offer. Big Cartel is an all-in-one solution, which means they either handle everything for you or make sure you’re able to access the things you need to run your own ecommerce store. This starts with hosting and design, which allows you to fulfill your hosting and web design needs from a single source. Big Cartel will set your site up on their servers. 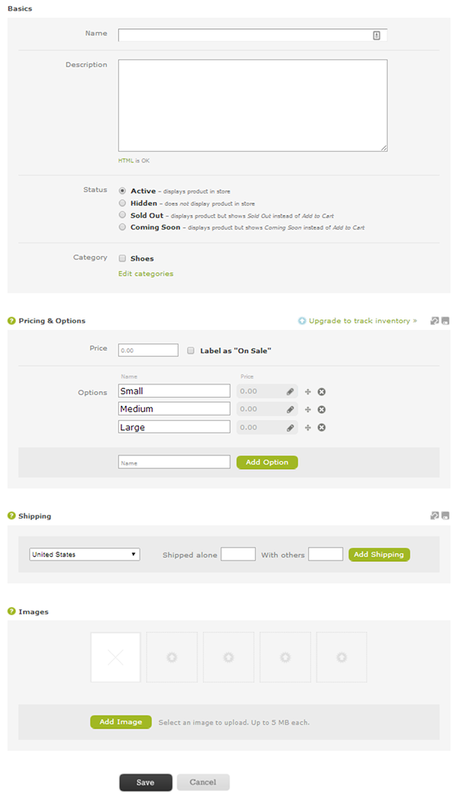 All you need to do is select which theme you’d like to use and add your products. Speaking of, it’s also incredibly easy to add products and manage your inventory with this platform. They even take care of SEO for you and allow you to use some of the industry’s leading payment gateways, such as PayPal and Stripe. 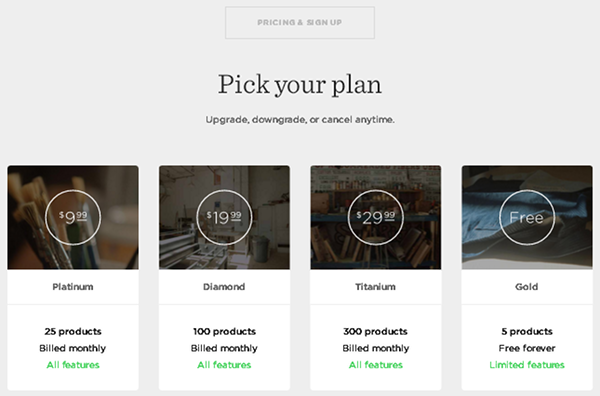 One thing you’ll have to look forward to with premium plans is inventory tracking that allows you to track how many items you have left in stock as well as how many you’ve sold. You can also set it up to have the frontend of your site display “Out of Stock” automatically when an item has been bought up. You’ll have access to analytics, the ability to use custom domains, the code for your site as well as the ability to use discount codes. Big Cartel allows you to use three sales channels. 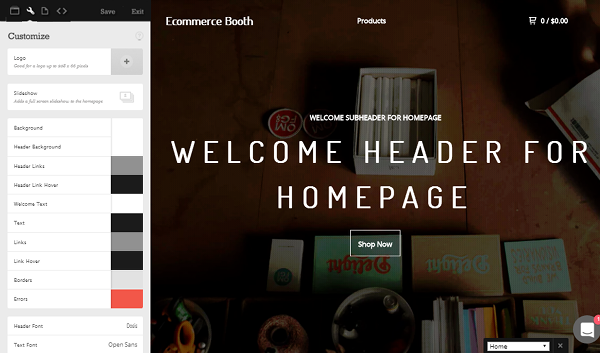 The first is your online store that you’ll build and host with Big Cartel. The other two are in person and on Facebook. You can sell in person by integrating your store with Apple Pay, which allows you to accept credit cards in person via Square or Stripe. You can also integrate your store with Facebook by installing the Facebook app in Big Cartel’s app market. This integration allows you to sell items from your Big Cartel store on Facebook to give Facebook users seamless shopping experiences. 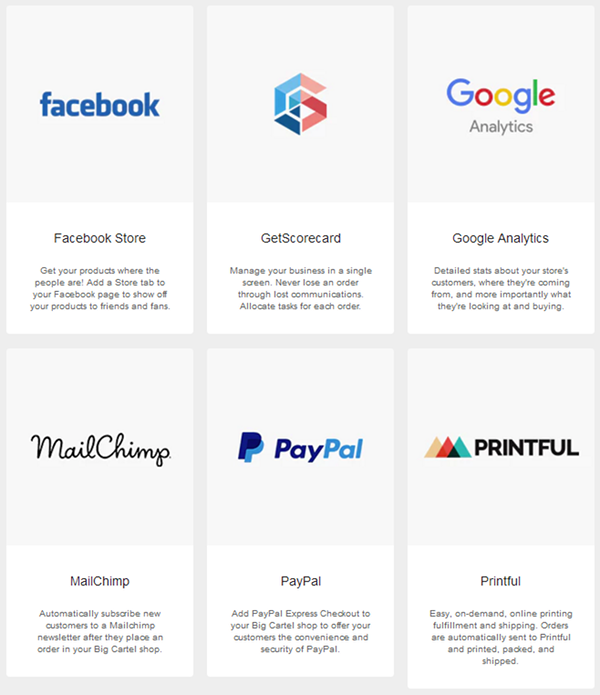 Big Cartel definitely has one of the smallest lists of apps of any ecommerce platform I’ve seen, but they’re all targeted toward creatives working in the ecommerce industry. There are also a few creative-related ones. They include creative drop-shipping services like Art of Where and Printful, both of which allow you to sell your designs on such products as leggings, t-shirts, smartphone cases and scarves. All you need to do is upload your designs. These services make and ship your products for you on demand. It also includes an app that integrates your store with Pulley, a service that lets you sell music, ebooks, videos, craft patterns, software, fonts and graphics. Big Cartel is incredibly easy to use, as mentioned before. It has over 10 free themes you can use and allows you to customize styles through simple point-and-click actions. All of the themes are well designed and will complement your work and artistic product images beautifully. Creating products and managing your store is also easy, but more on that later. Big Cartel allows you to set shipping rates based on a flat rate or destination. You can also set different prices for when products are shipped with others, such as when you buy a quantity of three of the same item. You can also use PayPal to calculate shipping costs. We also talked about how Big Cartel allows you to integrate your store with services like ShipStation, ShipRobot and ShipRush. These services allow you to keep track of shipments, print shipping labels, use specific shipping carriers and more. Big Cartel offers personal support in the form of a live chat system and email. It also has a few different ways you can learn and solve problems on your own, including dozens of articles in its documentation as well as an active blog. Big Cartel doesn’t have many features when it comes to store management, which we’ll get to in the cons. For now, let’s talk about the features it does have. They include integration with Google Analytics so you can gain key insight into where your audience is coming from and even how well your marketing campaigns are working through the use of custom dashboards. There are also a few analytics built into the Big Cartel dashboard natively, which are a summary of the search terms people used to find your store and what sites link to your store. You can also see what your most-viewed products are and who’s visiting your store. Big Cartel is not even close to being the strongest ecommerce platform out there, so it does have its faults. Let’s examine the most severe ones. Making educated business decisions is a lot more difficult with Big Cartel than it is with other ecommerce platforms. This is due to its lack of reporting features. It has no native reporting features nor does it integrate with any service that can bring these features to your store. Platforms like Shopify and Big Commerce have smart and powerful reporting features that allow you to see trends in your store and other data. This data helps you decide when to release sales for certain products and when to bundle certain products to encourage sales as well as who your most valuable customers are and which valuable customers haven’t purchased in a while. All you can do is make “blind” smart decisions without this data. Content marketing is one of the cheapest and most effective forms of marketing a platform can use, which is why it’s unfortunate that Big Cartel comes with no native blogging capabilities. Your only options are to link to your blog or integrate a blog you’ve created with a third-party service with your store, both of which aren’t nearly as efficient as a native blog would be. The latter option can even be a bit complicated. All plans have the same level of support. It doesn’t matter if you’re on the free plan or the most expensive plan, you’ll still receive the same level of support. You’d expect to get more features the more you pay, but unfortunately, all you get with Big Cartel is the opportunity to sell more products. You also become a much busier business the more you sell, which means customers on the Titanium plan, the most expensive plan, may lose precious downtime and even loyal customers from not being able to get ahold of support. Big Cartel doesn’t even offer 24/7 support, to top it all off. They only offer support between a set number of hours Monday through Friday. Creating products inside the Big Cartel interface is simple, but the lack of features on the New Product page is disappointing. For starters, there are no child categories. This gives you no way of organizing your products if you sell different types of products that fall under the same category. There’s also no hierarchy system for options. All you can do is add a list of options, as can be seen in the image above. I can’t group the Small, Medium and Large options under a parent option called Sizes. All I can do is continue adding options, which means any colors or other types of options I add will appear in the same list. You can, however, add an extra price to each option, which is nice. There’s also no SEO section on the New Product page, which means you can’t give each product an individual SEO title or meta description. Big Cartel is not the strongest ecommerce platform out there, but it’s important to remember that it’s marketed toward creatives who make and sell their own products. This is not a platform for business owners who you sell other types of products and have large inventories to sell. The lack of reporting features can be forgiven, but I highly recommend you to do your research and plan out your inventory before you create it to see if the lack of a blog, child categories and child options will have a major impact on your business and how well you run your shop. Big Cartel does have a free forever plan you can use to check it out, so be sure click the link below if you’re interested.